This was our first Nicholas County Fair, and what an event it was! :-) I ventured out by myself with my 7 year old brother in tow as well! So it was Brad, 6 goats and myself going to Summersville! We got there safe and sound, everyone settled in nicely! All and all a really great show that I can't wait to attend next year! Yes.. Yes it has. It has been 11 years since a animal came into my life that would change it in more ways than I can even begin (or know) how to explain! Yes, I said goat. On this day, 11 years ago my mom took my sister and I to pick out a goat. 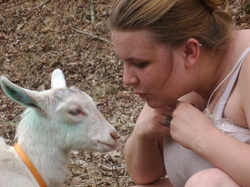 Now, the goat was for my 4-H project (my sister didn't get into doing animal projects until she was much older). I was 11 at the time, soon to turn 12. We get to the breeder's farm and realize all she has to choose from are triplet buck kids, one of which was really small and probably wouldn't have survived. I was determined, and so was my sister to get does. Well, my mom felt sorry for him and brought him home. His name was Target! Later, Target became a wether and learned how to pull a wagon or carry saddle bags. A few days later the breeder calls again, so we go back. This time I could choose a goat to bring home!!! :-) I picked up this little goat and she was mine. I named her Xena (Xena; Warrior Princess was my favorite show when I was younger). A few days after that Robin went to pick her goat out, a smaller framed doe that she called Rosie Posie. Target, Xena and Rosie were a joy to have around. They spent a lot of time in the house!! At that time we had NO CLUE how to keep a goat in, or anything and Robin and I soon became acquainted with having babies in the house! Nothing like getting woken up in the middle of the night by the screams of a baby goat! The goats soon became pets. 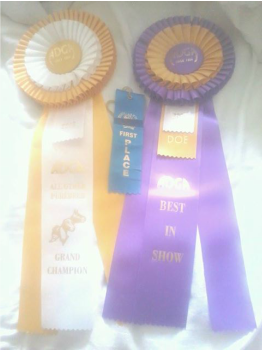 My neighbor, who raises Nubians kinda pushed my sister and I into going to the local farm show, which I'm glad she did! Showing soon became a passion that I still to this day love very much! 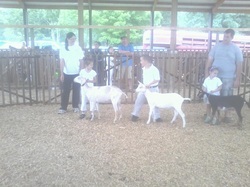 (I haven't been to a goat show since 2011 and then it was only to finish out my 4-H project at the county Farm Show). Shows became my favorite place to be other than at the barn with the goats! In the Spring of 2003 the girls kidded for the first time, Xena with a beautiful buckling and Rosie with a gorgeous doeling! Xena's buck, "Baby Boy" was left to nurse on her because Xena kidded while I wasn't home and wouldn't let my dad really mess with her. Rosie's doe kid however, was bottle fed from the get go!! 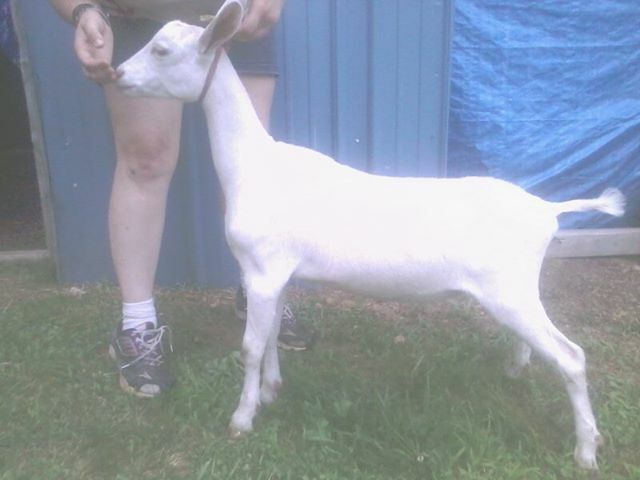 "Baby Boy" was sold to a family as a pet wether and "EarthStone Lil Dancer" was kept. Dancer soon became one of the best does in the herd! She had an attitude, that's for sure but she was my favorite goat, right up there next to Xena. Xena, Rosie and Target all stayed until they passed away but the girls left daughters that were just amazing. Up until the house fire I still had a Xena daughter, but afterwards I had to sell her due to I didn't have time for the goats. Now, 11 years later I have re-started the herd. This time going with well bred Saanens, but Xena and Rosie are always there with me when I milk or do anything at the barn! No one has carried the EarthStone herdname in three years, next Spring will mark the 11th year that goats have carried just EarthStone (without any "the" in front)! And what a great way to come back in with beautiful Saanens!!! So yes, it really has been that long!!! There's Spring in the air and.....baby animals? Friday will mark two weeks until BobbieJo and Alexandra are due to have kids. However, concidering the stress and everything of being moved they may have them sooner!! I can't wait! I'm hoping for does, of course but will be happy just for them to be healthy! I can't wait! I bred our NZ Rabbit doe, Tequila to our Ca. Cross buck Transformer for April kits!! :-) I can't wait! I'm hoping she took!! I know she was in heat! This spring will bring LOTS of babies of all kinds!! I'll be sure to share pictures! !